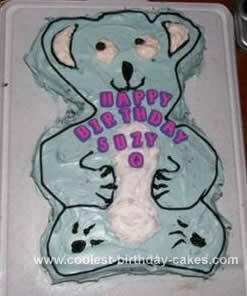 I made this Koala Bear Cake a few years ago for a co-worker’s b-day. She heard about the strange cakes I’ve made in the past for friends and asked if I could make a Koala cake. As you can tell, I did not use any sort of pan, cut it free hand with a knife from a 9×13 cake pan. The cake is frosted with tinted butter cream frosting. I used a steel blue color in place of gray to give it a more cartoon feel.